Process all the ingredients, except the water, together until smooth. Add a little water to receive the desired thickness and texture. Spread the hummus in a shallow bowl, garnish with a sprinkle of red pepper flakes and a generous drizzle of olive oil. You can garnish your hummus with a few chickpeas and a sprig of parsley. Or to make Hummus b’awerma, garnish with Awerma, a topping of browned ground meat with its fatty drips. Grab some pita bread and dig in! 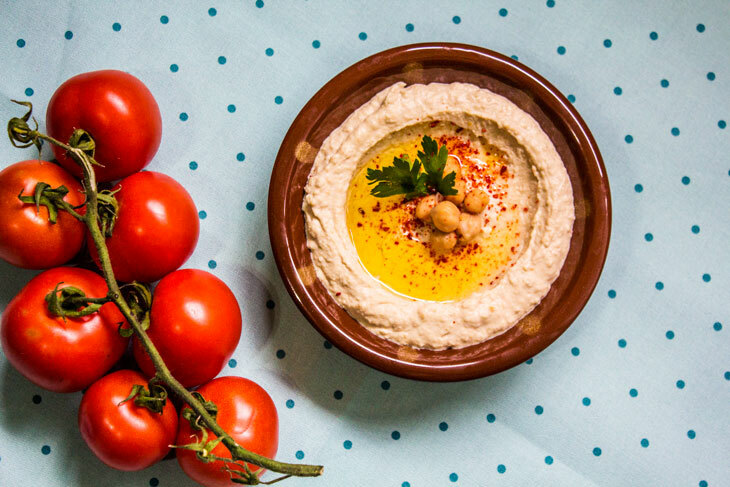 Although Hummus means chickpeas in Arabic, many variations of hummus are made with other beans or by introducing vegetables in the mix.